Is your hair affecting your confidence? Our precision, technique, and extensive artistic background have provided a true satisfaction to many of our clients that have traveled throughout the world to our facility to experience this exciting procedure. We can create a natural or manicured look depending on your preference. Everyone's wants and needs are different, so we customize each hair follicle thickness and pigmentation placement. Hair Follicle Simulation/Scalp Micropigmentation is an amazing procedure and can be customized to create that natural hair look. Experience ” The JHON-JHON Experience” our clients are talking about! 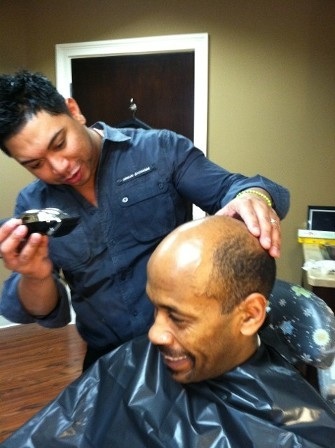 JHON-JHON Hair Follicle Simulation will make sure they do what they can to give you the confidence and trust you need! Let’s make it happen! We specialize in YOU. No quick fixes, shortcuts, or impersonal treatments. Advanced wellness techniques to enhance your appearance, reclaim happiness and regain confidence once again in life. The JHON-JHON® Experience pioneers solutions that deliver long term results with long-lasting happiness. Confidence, happiness and well-being starts today. Please include clear pictures of the front, back, top, right and back of head. I would like to schedule an appointment! I would like to learn more! What is "The JHON-JHON® Experience™"
What is Hair Follicle simulation/ Scalp Micropigmentation/ Hair Loss Tattoo, and is it right for me? ​Hair Follicle Simulation (HFS)/ Scalp Micropigmentation (SMP)/ Hair Loss Tattoo is a form of paramedical cosmetic tattooing (micropigmentation) that camouflages hair loss by mimicking the look of natural hair. The procedure is ideal for people suffering hair loss-- receding hairlines, alopoecia, excessive scarring from hair transplants, and/ or have suffered from hair loss due to chemical burns, hair extensions, braiding, or weaves. This procedure is referred to by many names-- Hair Follicle Simulation (HFS), Hair Follicle Replication (HFR), Scalp Micropigmentation (SMP), Hair Loss Tattoo, Hair Tattoo, Head Tattoo, Scalp Tattoo, and a variation of many others. Although it may be referred to as a tattoo, the pigment is only inserted into the dermal layer of the skin and our inks do not change color after applying like a regular tattoo does. Why can't I go to a tattoo artist at a tattoo parlor and get this done? ​New Jersey is a regulated state for Micropigmentation. Tattoo artists are NOT Micropigmentation Practitioners. Board Certification is required by The American Academy of Micropigmentation (AAM), which includes completion of an extensive training program, in addition to years of experience. Some states such as New York do not have Micropigmentation tattooing regulations. Anyone can pick up a tattoo gun and tattoo the public without any training necessary. Please do your research before choosing a clinic. Our center is Board Licensed and approved for any type of Permanent or Paramedical Cosmetics procedure. Our practitioners are Fellows of the American Academy of Micropigmentation and are Nationally Board Certified. In addition, we are licensed to use topical anesthetics to minimize discomfort. Why can't I go to any Permanent Cosmetics practitioner? ​We highly recommend that this technique be performed by a specialist in Hair Follicle Replication/ Scalp Micropigmentation. Specialized techniques, specifically- designed needles, and specially- formulated hair color pigments are used in comparison to traditional permanent cosmetic "make-up" practitioners. This is considered a paramedical procedure that safely focuses on creating the illusion of hair follicles to camouflage areas on your head and body. Our practitioners are not only specialists in this area, but also have the compassion and understanding for how upsetting it is to lose your hair. Even Jhon-Jhon and many other staff members are proudly showcasing their unnoticeable Hair Follicle Replication/ Scalp Micropigmentation/ Hair Loss Tattoo. ​The exact cost for Hair Follicle Replication/ Scalp Micropigmentation/ Hair Loss Tattoo will vary for each individual due to a number of factors such as the size and location of the desired area, scarring from Hair Transplant procedures or accidents, and the style desired. An exact quote is customized to each individual based upon your consultation with one of our trained consultants. Why do I need to send in pictures and can you give me an estimate from the pictures I send in? ​Due to the high- volume of clientele, you will have a preliminary phone consultation prior to scheduling your appointment. 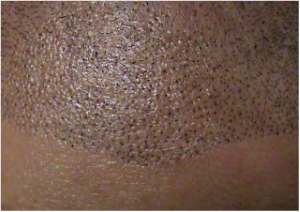 Pictures are needed for our consultants to make sure that you are the right candidate for Hair Follicle Replication/ Scalp Micropigmentation/ Hair Loss Tattoo. Phone consultations will not be performed without your complete set of pictures. The exact price quote will be evaluated by your practitioner during your FREE in-person consultation. What type of pictures should be sent in to be evaluated? You should send in clear pictures of your entire head from every angle-- front, back, left, right, and top view, as well as any areas of concern such as scars from hair transplants or accidents. Please take care to take the photos in good lighting without any glare or obstruction. You can upload and submit your photos in the contact form above. Alternatively, the photos may be emailed to hfr@jhonjhon.com. Please be sure to include your name and phone number with your set of photos. Can I get my procedure done the same day as the consultation? ​Of course! When scheduling, please let your consultant know that you would like to get your consultation and procedure done on the same day, and he/she will make the necessary arrangements. ​Typically, your visit should last between 3-5 hours depending on how much of your head will be treated. We dedicate the first 30-60 minutes to fill out initial client paperwork and have an in-depth consultation with your practitioner. Then, your scalp will be numbed with a unique non- allergenic topical anesthetic (a period of time which you will spend relaxing in your private room). Then, the actual application will last between 2-4 hours. Feel free to bring materials to read for relaxation and/ or a laptop. Wi-fi will be available for your use. Is this a permanent procedure? How long does this last? ​Technically, this procedure is considered permanent because the color is implanted in the upper reticular part of the dermal layer of the skin, and cannot be washed off. However, as with any tattoo, fading can and often does occur, requiring periodic maintenance, or color enhancement. Just like our natural hair color, implanted pigment in the skin may fade with time. We offer one year of touch-up treatments to address any fading. The life-span of this procedure varies for each individual based on ethnicity, sun exposure and products used. Typically, the Hair Follicle Replication will last anywhere from 3-15 years. ​We are able to offer our non-laser tattoo removal service, EliminInk, to our customers if need be for any reason. We also specialize in Scalp Micropigmentation corrections, repair and removal for anyone who has received undesired results from other places that provide similar services. For more questions on how this process works, please check out or EliminInk page. Will the Pigment turn blue/ green/ gray or fade over time? ​The specially formulated pigments we use to replicate hair follicles with a natural look, and are not designed to do so. Traditional tattoo inks are not used due to the high possibilities of ink fading into blue or green. Naturally, the color(s) will lighten and soften over time, so in the long- term, it may be necessary to undergo additional treatments. Does it matter what color my hair is? What Pigment colors do you use? ​We have a huge selection of pigments that is specially mixed to match any hair follicle. ​We use an array of computer controlled, sterile, single- use microfine needles to penetrate the dermal layer of the skin and achieve the consistency of results that Hair Follicle Replication/ Scalp Micropimentation/ Hair Loss Tattoo requires. This prevents the needle from being inserted any deeper in to the skin than programmed). The needles we use are created specifically for very fine hair strokes/ dots to replicate the hair follicle. Sterile disposable needles and single, individual containers for pigments are used to avoid any possible contamination and to prevent the transmission of any diseases opposed to autoclaving and reusing needles. With autoclaving, it is possible that needles may not be 100% sterilized due to a mechanical problem with the autoclave or human error. We heavily promote safety and sanitation, and avoid the risk completely by using disposable needles. Please do your research for the safety of your health and well being. How should I prepare for my Hair Follicle simulation/ Scalp Micropigmentation/ Hair Loss Tattoo procedure? ​Prior to arrival, we recommend that you come in for your consultation and/ or procedure wearing the hair style you prefer. How much pain will I feel during the procedure? ​Though this mostly depends on your own personal pain tolerance, we do provide ways for you to feel the most relaxed during your procedure/ For the first 30-60 minutes of your visit, you will relax in your private room where you may watch TV, read, or go on your personal laptop while our unique, non-allergenic topical anesthetic is applied on the treatment areas. This should numb your head thoroughly and comfortably. Topical anesthetic will also be applied regularly during your procedure. Clients who have mentioned that they have low pain tolerance have recommended for new clients to receive a prescription for pain medication from their primary physician, or simply bring in some Ibuprofen and Acetaminophen to ease the pain. It is important that blood thinners and/ or aspirin is not taken before the procedure. Who will be performing the Hair Follicle simulation/ Scalp Micropigmentation/ Hair Loss Tattoo procedure? ​All of our Hair Follicle Simulation/ Scalp Micropigmentation/ Hair Loss Tattoo specialists are AAM Nationally Board Certified Micropigmentation Practitioners, so you can rest assure that you will be in great hands no matter what. What are touch-ups? Are they necessary? ​Individual body chemistry and adherence to aftercare instructions has a direct affect on the outcome and results of your treatment. We provide touch-up services to retouch colors due to fading, accidental removal, color change, and/ or color rejection due to previous scars or body chemistry. More information will be provided at your consultation. Can you have the Hair Follicle simulation/ Scalp Micropigmentation/ Hair Loss Tattoo done before or after receiving a hair transplant? ​Absolutely! They complement each other. We fill in the gaps between the hair transplants to give a fuller and natural look. We cover up and hair transplant (HT) scars with replicated hair follicles. Your HT scar(s) must have been performed at least 3 months prior to your Hair Follicle Simulation/ Scalp Micropigmentation/ Hair Loss Tattoo and fully healed to perform the procedure (Medical clearance is necessary from your doctor). And typically you should wait at least 3 months as well before moving forward with a hair transplant after Hair Follicle Simulation/ Scalp Micropigmentation/ Hair Loss Tattoo has been done. 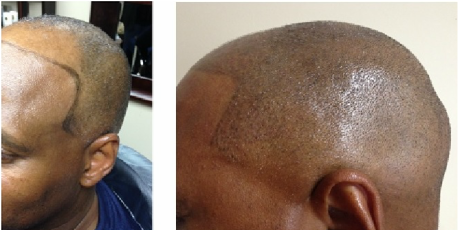 How does Hair Follicle simulation/ Scalp Micropigmentation/ Hair Loss Tattoo differ from other hair alternatives? What are the pros and cons? 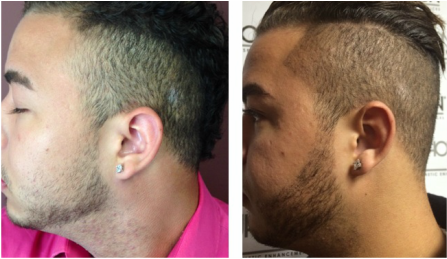 Hair transplant surgery permanent restores hair and can be painful after surgery. Side effects can include infection, scarring, and loss of hair in other areas. The cost is significant and recovery time is for at least a few weeks. The procedure is not guaranteed. Wigs, lace-front wigs, toupees, hair systems/ hairpieces can disguise hair loss temporarily and usually require costly maintenance and discomfort. Topical drugs such as Rogaine and Propecia must be taken each day and results are seen within a few months, and can lead to undesirable effects. Fill-ins, shake-in powders and sprays are not fully water resistant and may stain clothes. What is the healing or recuperation time? ​The healing time varies for each and every individual. It may be within a week, or even a couple of days. There may be a little redness, swelling or bruising immediately after the procedure. A small number of clients may have redness for a few days, depending on their skin sensitivity. Most of our clients return to work the next day. The ink may seem a bit darker for the first couple o days. The final color and results will typically be between three to six weeks. Please follow the simple aftercare instructions that will be given to you. How do you service high- profile clients who are in the Entertainment Industry? (i.e. Actors, models, singers, athletes, etc). ​Your service, as with any other client, will be strictly confidential. Our establishment has private rooms and special appointment times can be arranged for more privacy. We are known for our professionalism and hospitality. We have humbly serviced a good handful of individuals in this industry, so we understand what type of service we need to provide to make your stay a pleasant experience. We have thousands of clients who fly in from all over the world for our specialty services. Please kindly inform us immediately if you require special arrangements. 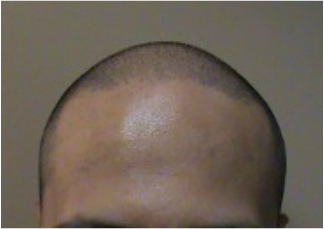 I had a bad experience from an inexperienced Scalp Micropigmentation/ Hair Tattoo establishment. 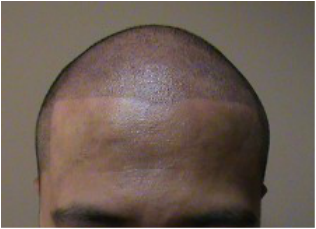 Do you do Scalp Micropigmentation/ Hair Loss Tattoo repair and removal? Yes, Jhon-Jhon is also a Certified Tattoo Removal Practitioner and Trainer for EliminInk. His experience in tattoo repair and removal enables him to be an expert in all of his corrective cosmetic procedures.